There are some awesome examples of User-Generated Content on Instagram. We set out to find some of them for you to share in this post. Here are 7 brands who have grown their presence online through the clever and savvy use of User-Generated Content. What is User-Generated Content & Why Does it Matter? User-Generated Content (UGC) is just what it sounds like – content generated by users. It’s content created and shared by your community around your brand or product or message.There’s one type of marketing that has taken off over the past few years. It’s User-Generated Content. Even though we might think of ourselves as master storytellers, the stories we tell about our brand can never be as powerful – or as prolific – as the stories our community tell about us. If someone takes the time to tell a story about their experience with you, your destination, your product, your business, then they have an affinity with you. Their story is worth 1000 times what you can say about your own business. That’s why user generated content is so powerful when you can tap into it the right way. The Tourism industry is notoriously good at empowering user-generated content. Australia set the scene with their #seeaustralia hashtag which grew their account to be one of the biggest Facebook pages for a destination (and then on Instagram too). Destination Marketing Organisations around the world use UGC effectively to market across a range of social platforms. But what about other types of businesses? 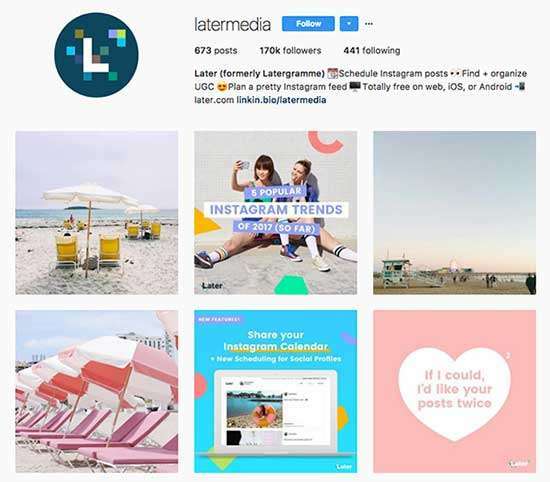 Let’s take a look at a few different types of businesses that are using User-Generated Content on Instagram in effective ways. They include software companies, and product companies (and of course, tourism). 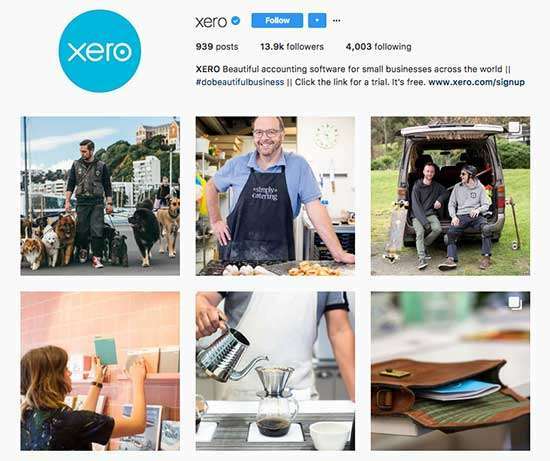 Xero makes accounting fun on Instagram. Xero is the accounting software that I use. I cry when I think about how many hours of my life I wasted with accounting in our two businesses before I started using Xero. Xero is amazing, and it almost makes accounting fun. But, you might be thinking “why in the heck are we talking about them on Instagram?”. Well, even an accounting software company can create great content! They do it by not posting about accounting software very much at all. Even though their software is awesome. They do it with User-Generated Content on Instagram. They do it by telling the stories about the small businesses all over the world using Xero to save time and get more done! They also showcase “Xero Businesses” through products they create – sharing great products and a story about the product or business. Xero use the hashtag #DoBeautifulBusiness as their key hashtag, along with #Xero and #XeroCustomer. They also tag their customers in the post so you can find and follow them. 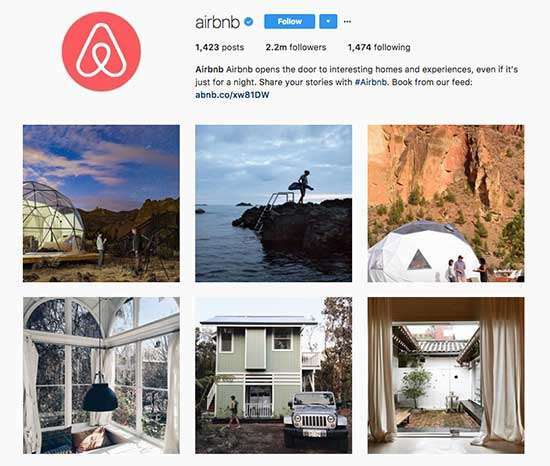 Airbnb are one of the most successful Instagram accounts using User-Generated Content. In fact, they are almost 100% based on User-Generated posts. Airbnb curates the stories of thousands of people with User-Generated Content on Instagram. They get permission to share the content and use the answers to these questions to guide their storytelling. It’s our job to listen, understand why you travel, and tell your story back to the audience that’s following us – Eric Toda. Airbnb do a great job of showcasing the stories of their guests, their hosts and those that provide local experiences. Marsha’s a prizewinning writer with deep roots in Detroit music (her dad produced Aretha Franklin, for starters). Her stories of the city’s history could fill several fat, page-turning books, but you’ll have to make do with two days in her company. You’ll share a couple of meals, browse local vinyl treasures at Peoples Records, and attend a jam session at Bert’s Marketplace, one of the city’s longest-running music venues. ⠀⠀ It’s just one of the Detroit adventures you can find on Airbnb, in addition to hundreds of homes. Click the link in our bio for more. Now you can find things to do on Airbnb, not just places to stay. Got a few hours to spare in Seoul? Put yourself in the skilled hands of Junho, an expert local calligrapher who has juried major exhibitions. Along with a few other guests, you’ll be welcomed into his studio to see masterpieces of traditional calligraphy and seal-making—and hear the stories behind each. Next, Junho will teach you calligraphy essentials, from using an inkstone to proper brush technique. You’ll come home with a finished work of your own and a new appreciation for this soulful, demanding art. ⠀⠀ Click the link in our bio for other ways to make your mark in Seoul, like preparing a classic meal or creating your own perfume. 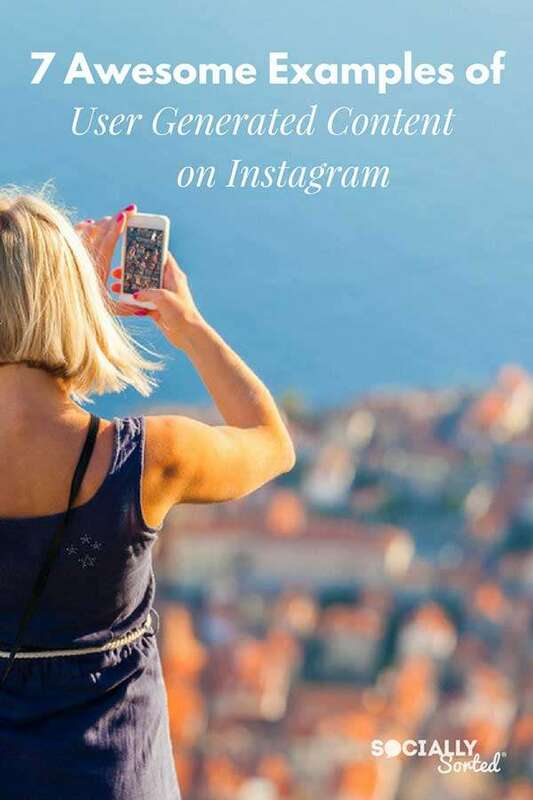 AirBnB use a number of hashtags for User-Generated content on Instagram. These include the #AirBNB Hashtag but also #NotYetTrending (to feature unique, not-yet-discovered places). Their hashtag #LiveThere also taps into the wonder of “living” in a city vs just visiting… and how you can do it with AirBnB. Be like Frank. Be Frank. I have long admired Frank Body’s use of User-Generated Content on Instagram. Partly because it’s savvy marketing, partly because it’s sassy and cheeky and partly because it’s just so fun having “Frank” (he’s a coffee body scrub, by the way) speak to you as though he is a real person. Even the bubs get in on the fun! 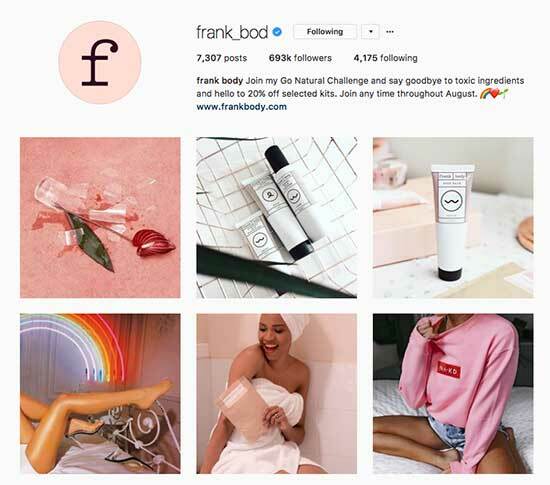 Frank Body share loads of User-Generated Content on Instagram – their audience revels in lathering themselves in coffee grounds and taking selfies! Breaking news: Babe discovers how to have luxurious four hand spa experience at home. Frank Body have built a huge hashtag hub of content using the hashtags #letsbefrank and #thefrankeffect. If you know me well you know that I love to travel and I am fortunate to do a lot of speaking and training in the Tourism Industry (mainly around visual storytelling). 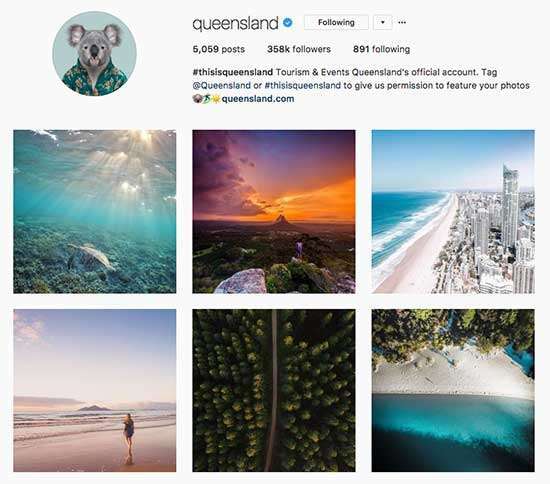 I often use Queensland as an example of best practice when it comes to sharing User-Generated Content, and I get to shout out about the state where I live! Get above it with Queensland! But I want to point out how they are really showcasing a particular type of content lately – drone photography and videos. Drone footage is still new and it gives us such a fresh perspective on all the places that, until now, have been photographed so many times in familiar ways. An Aerial perspective feels like you are seeing it for the first time! Want to lose yourself in Queensland? Search on #ThisIsQueensland. On and don’t forget to use it when you come here. You are coming, right? Moment make exceptional lenses for iphones – to help turn your phone into a professional-ish camera. 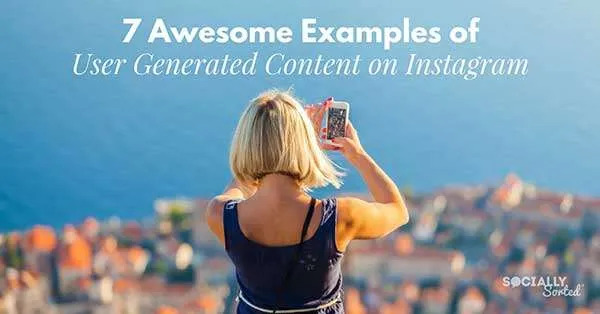 Naturally, they have a good eye for images too but they also (like all the brands mentioned here) excel at leveraging User-Generated Content on Instagram. So, it’s a no-brainer that they should have grown a strong, passionate community of iphone-photographers using their lenses for zooming, macro-ing, and all the iphoneography things! Phenomenal woman. A stunning portrait by: @jhasthlr⠀ .⠀ Don’t forget to tag all your photos shot with Moment lenses, #ShotOnMoment for a chance to be featured! The guys at Moment ask their community to use #shotonmoment to be featured. And over 120k photos says it’s a great hashtag! Check out their hashtag hub here. Later is another software tool that I love. They have a killer app for scheduling and posting to Instagram. It should be no surprise that an Instagram app uses Instagram well, but you’d be surprised how many don’t! 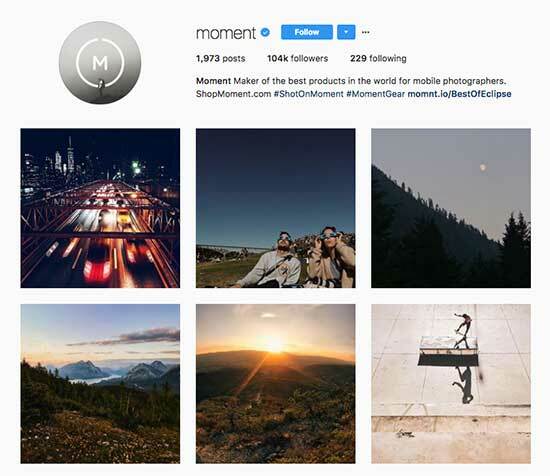 They have built a solid following by using … you guessed it.. stunning User-Generated Content on Instagram. Not only do they share great UGC but they plan their feed to look gorgeous and curated. Which, again, is no surprise, as Later has a really cool preview tool for planning out your feed. Check out their feed here. Later are masters at curating content but don’t have a specific hashtag to get shared on their feed. However, one thing I will say about hashtags on Later is that their tool LOVES hashtags. They have a really cool Hashtag and Caption tool, so you can save your favourite hashtag sets/hubs to use again when you post. I want to round out this post with Buffer. 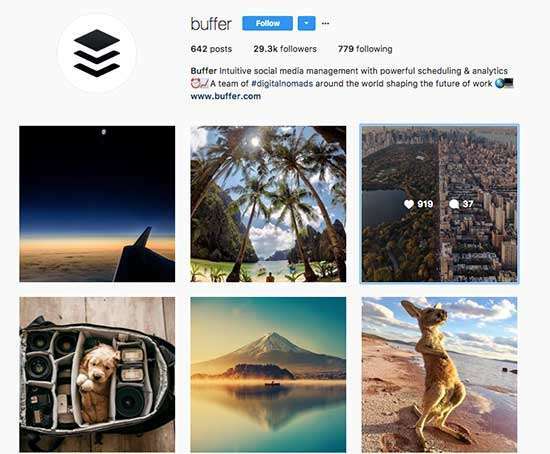 You probably know Buffer as being an awesome social media scheduling tool and their team posts some of the best, most helpful blog posts on social media and marketing. But their feed is something really cool on Instagram. It’s not just about social media. Instead they showcase another part of the Buffer lifestyle. They have a nomadic team, working remotely around the world. Their feed shares the essence of just that – working remotely around the world. In fact, it shares the “world” in general. They do it by sharing images posted by their Buffer Community (and their own). The #BufferCommunity is strong my friend, it’s strong. Check out their curated feed of Buffer-ites here. There’s a LOT of community on this page – these brands are doing it well when it comes to sharing the content of others. It’s easy to think that you can just go an share someone else’s photo on Instagram as long as you tag them. Just because others do it, doesn’t mean you should too. There have been a number of cases recently where legal issues have arisen. It’s simple to ask for permission – always get permission in writing and also credit the person on your post. You can do this easily by sending a DM or posting on their feed to ask for permission. If you do it this way, be sure to take a screenshot of the permission in case the post disappears. The best way to ensure you are legally covered when sharing User-Generated Content is to use a tool that manages your rights requests and permissions and stores the images too. Tack is a great tool for managing the entire process of getting rights permissions. I wrote about Tack here. Check it out. If you are diving into User Generated Content you will want to have a system for seeking permission, storing permission and sharing content. Tack is all that. 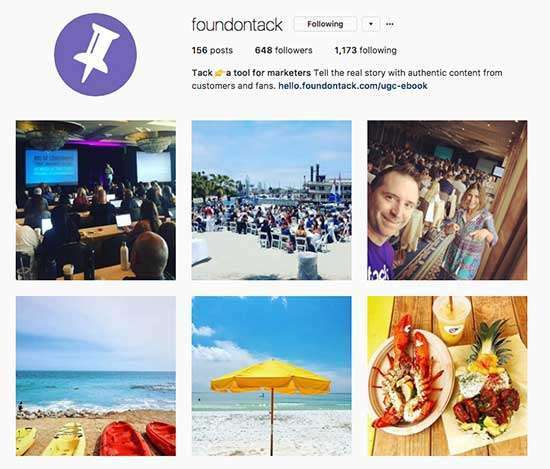 Are you using User Generated Content on Instagram? Did this post give you some ideas? Tell us in the comments below what your favourite account is to follow for UGC!